Toy Story Land opened a little over a week ago so me and Melyssa are ready to discuss our impressions of the new addition to Hollywood Studios. We have had the opportunity to visit the land during the morning, at night and even before the rest of the park opened during a special event with the Park Blogs team. With all of that in place it is ready to speak what we feel works and maybe what does not. Following that we all review the latest offering from Marvel Studios as ANT-MAN AND WASP hit theaters. Part 2 of this week's D23 Expo coverage is all about the MASSIVE announcement of the Parks and Resorts Panel!! 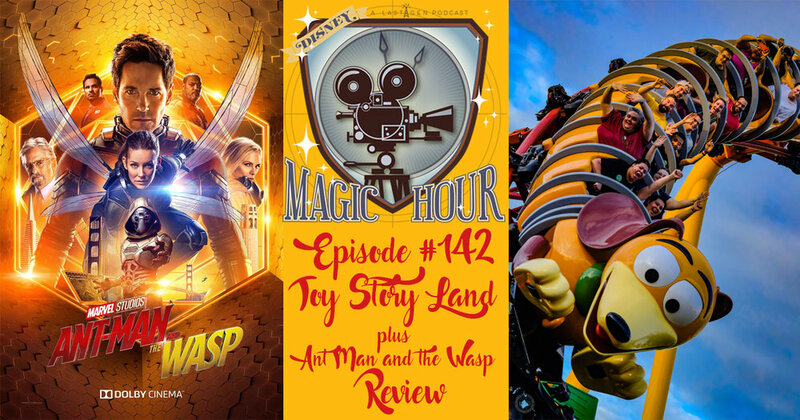 This week we are joined by Lou Mongello, host of the WDW Radio Podcast, to discuss all the reveals for parks and resorts at this year's D23 Expo, including Star Wars and Toy Story Land. So to lift a quote from our guest, “Sit back, relax, and enjoy” this week's episode of the Disney Magic Hour. Interested in joining us and Lou for a Disney Cruise aboard the Fantasy - complete with a Star Wars Day at Sea, and stops at Cozumel, Grand Cayman, as well as Disney Castaway Cay, while also celebrating the 9th Anniversary of the WDW Radio Podcast - head over to WDWRadioCruise.com for more information and a free no obligation quote. This week's track was FORGET!